Our Portable Utility heater features a polarized plug (2 prong) and 6' cord for ease of use and portabilty. The unit has two heat settings and an automatic thermostat for heating level control. 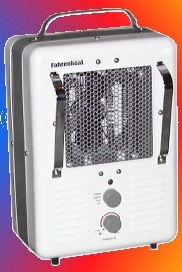 The fan can also be operated with heat for just air circulation. Other safety features include a tip over switch and thermal high limit. The Q'Mark MMH1502T has a high output of 1500 watts (5120 BTU's) and a low output of 1300 (4437 BTU's) and draws 12.5 or 10.8 amps. The Q'Mark part number is MMH1502T.